Police have arrested 22 people working at one of Israel's biggest commercial banks over suspected money-laundering. The Bank Hapoalim employees are thought to have been involved in an operation worth hundreds of millions of dollars. Police chief Amichai Shai said the affair was one of the largest in Israeli history and involved funds from several other countries. Investigators say employees helped customers move money without reporting the transfers. "It appears they helped customers transfer funds without reporting it as required by law. 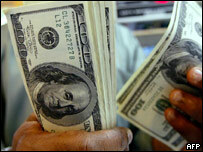 We are talking about hundreds of millions of dollars," Mr Shai said at a press conference. Police said that funds had passed through the bank from many countries but cited only France as one of them. Police said they were examining more than 80 bank accounts linked to 170 customers. All the employees arrested worked at a central Tel Aviv branch of Bank Hapoalim. After introducing anti money-laundering legislation, Israel was removed from an OECD money-laundering blacklist in 2002. In a statement the bank said it had ordered its employees to co-operate fully with the investigation and said it had taken several measures to prevent funds being laundering through the bank.